There are three ways of ALP poisoning that are ingestion, inhalation, and absorption through the skin. ALP ingestion poisoning has a wide variety of symptoms such as nausea, diarrhea, headache, abdominal pain, hypotension, congestive heart failure, myocarditis, and arrhythmia. Respiratory features are dyspnea, acute respiratory distress syndrome, and pulmonary edema. One of the uncommon presentations of ALP poisoning is intravascular hemolysis. Here, we report a patient with ALP poisoning presented with intravascular hemolysis secondary to G6PD deficiency. The interesting part of this report is that the patient had not experienced any episode of hemolysis until the age of 24. A 24-year-old man, presented to the Khorshid Hospital emergency department with nausea and vomiting 2 h after ingestion of one tablet of ALP. The patient admitted in the poisoning emergency department. The patient's partner brought a pack of ALP tablet and said that the patient ingested one of them. There was not any way in the department for checking the level of ALP in the blood. There was not any history of ingestion of other drugs. At admission, he was conscious and had stable vital signs. There was not any sign of icterus, shock, fever, dark urine on the 1st day of admission, and laboratory data were normal. A normal electrocardiogram was recorded from the patient. He had no history of medical illness, anemia and had not admitted to the hospital until that day. He had a family history of G6PD deficiency in the daughter of his brother. He mentioned that there was not any history of hemolysis and hospital admission after ingestion of fava beans till that day, but he did not care about the occurrence of icterus. Treatment with N-acetylcysteine 300 mg/kg and Vitamin E 600 mg was done. Two days after admission signs of icterus were appeared. 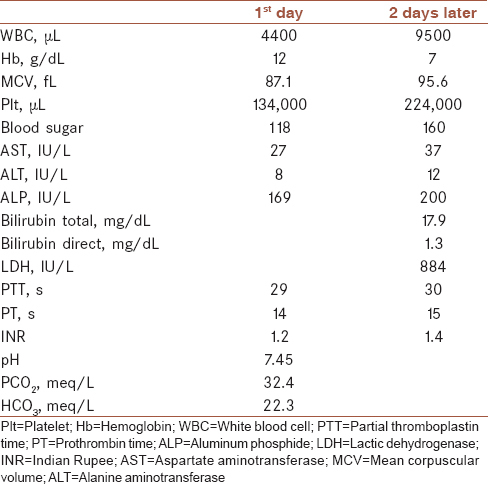 The results of laboratory data on the 1st day and 2 days later are shown in [Table 1]. The patient did not mention any history of abdominal pain, dark urine and the result of urine analysis is shown in [Table 2]. Due to the blood test results, we evaluated the cause of hyperbilirubinemia and anemia. Hence, peripheral blood smear was seen, and retic count and Coombs test were applied. A peripheral blood smear revealed severe anemia with microcytic feature and bite cell and spherocytosis. 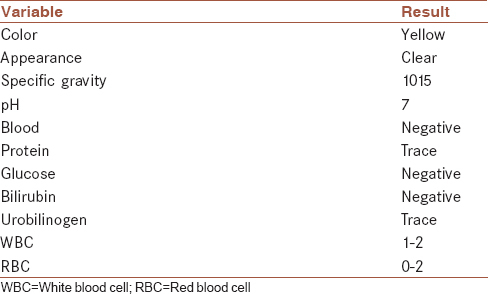 White blood cell count was with a predominance of neutrophil. Platelet count and morphology were ok.
Reticulocyte count was reported to be 12.7%, and the reticulocyte production index was 2.9. Direct and indirect Coombs were negative. Due to the laboratory data and negative Coombs test, autoimmune hemolysis was excluded. As it was not any signs of cyanosis and discoloration of blood, methemoglobinemia due to ALP ingestion was excluded. Ingestion of any other drugs was not reported, and so hemolysis due to them was not considered. The patient treated with saline hydration and conservative management and hyperbilirubinemia and icterus became better. Packed cell transfusion was not done during the hospitalization. One month after resolution of hemolysis, the level of G6PD was checked, and the result was completely deficient. In this study, a new case of G6PD deficiency hemolysis induced by ALP poisoning is reported. Although ALP toxicity is fatal, the patient survived. A known case of G6PD deficiency reported in Farnaghi et al. study that had an episode of hemolysis after ingestion of one tablet of ALP. In comparison to this study, our patient was not a known case of G6PD deficiency until the age 24. A case of hemolysis after ALP poisoning in a 15-year-old boy with G6PD deficiency was also reported in Pakistan, and the patient survived. Oxidative stress and extra-mitochondrial release of free oxygen radicals have been suggested as a cause of ALP toxicity. Due to the extensive red blood cell (RBC) lysis in G6PD deficient patients, a theory of prevention of the disseminated oxidative stress distributing by the phosphine-damaged RBCs is appeared. For investigation the protective effect of G6PD deficiency, research was done in rat hepatocytes. G6PD deficiency significantly reduced hepatotoxicity of ALP in rats. Due to the previous case reports and this report, larger study in animals is suggested. Drugs with the power to induce such deficiency may be promising in the treatment of ALP poisoning. AV contributed to the conception of the work, revising the draft and agreed to all aspects of the work. MS contributed to the conception of the work, revising the draft, editing the manuscript and agreed on all aspects of the work. Agrawal VK, Bansal A, Singh RK, Kumawat BL, Mahajan P. Aluminum phosphide poisoning: Possible role of supportive measures in the absence of specific antidote. Indian J Crit Care Med 2015;19:109-12. Sood AK, Mahajan A, Dua A. Intravascular haemolysis after aluminium phosphide ingestion. J R Soc Med 1997;90:47-8. Gurjar M, Baronia AK, Azim A, Sharma K. Managing aluminum phosphide poisonings. J Emerg Trauma Shock 2011;4:378-84. Farnaghi F, Owliaey H, Hassanian-Moghaddam H, Shadnia S, Momtazmanesh N, Zamani N, et al. Intravascular Haemolysis due to Glucose -6- Phosphate Dehydrogenase Deficiency in a Patient with Aluminum Phosphide Poisoning. Indian Journal of Forensic Medicine & Toxicology 2013;2:79-81. Humayun M, Haider I, Badshah A, Subhan F. Protective role of G6PD deficiency in aluminium phosphide poisoning. J Coll Physicians Surg Pak 2015;25 Suppl 1:S66-8. Srinivas R, Agarwal R, Jairam A, Sakhuja V. Intravascular haemolysis due to glucose-6-phosphate dehydrogenase deficiency in a patient with aluminium phosphide poisoning. Emerg Med J 2007;24:67-8. Zamani N, Mehrpour O. Protective role of G6PD deficiency in poisoning by aluminum phosphide; are there possible new treatments? Eur Rev Med Pharmacol Sci 2013;17:994-5. Salimi A, Paeezi M, Yousefsani BS, Shadnia S, Hassanian-Moghaddam H, Zamani N, et al. Inhibition of glucose-6-phosphate dehydrogenase protects hepatocytes from aluminum phosphide-induced toxicity. Pestic Biochem Physiol 2017;143:141-6.